Immigrant entrepreneurship is the subject of a prolific economic literature, as well as a source of wide public debate. This is because the participation of immigrants to the business community can provide a significant contribution to innovation and to market dynamics. 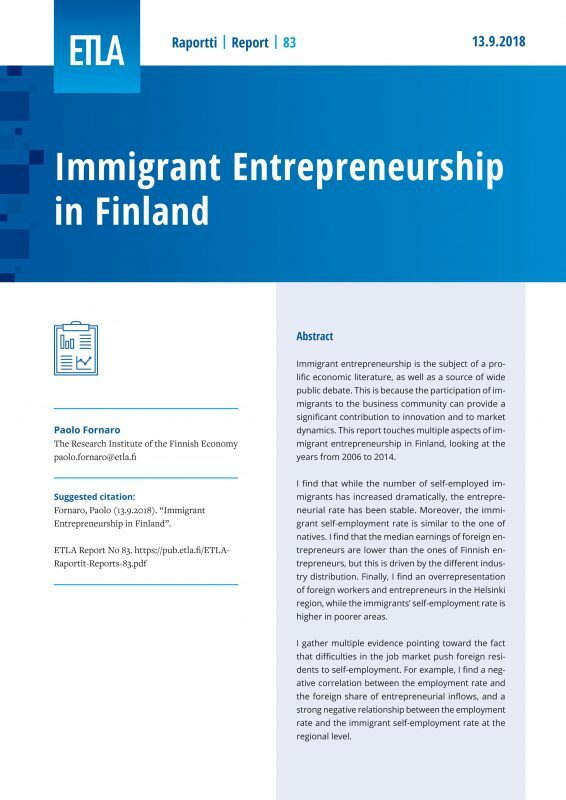 This report touches multiple aspects of immigrant entrepreneurship in Finland, looking at the years from 2006 to 2014. I find that while the number of self-employed immigrants has increased dramatically, the entrepreneurial rate has been stable. Moreover, the immigrant self-employment rate is similar to the one of natives. I find that the median earnings of foreign entrepreneurs are lower than the ones of Finnish entrepreneurs, but this is driven by the different industry distribution. Finally, I find an overrepresentation of foreign workers and entrepreneurs in the Helsinki region, while the immigrants’ self-employment rate is higher in poorer areas. I gather multiple evidence pointing toward the fact that difficulties in the job market push foreign residents to self-employment. For example, I find a negative correlation between the employment rate and the foreign share of entrepreneurial inflows, and a strong negative relationship between the employment rate and the immigrant self-employment rate at the regional level.